We will reply you ASAP. Bead colors are random. Type: 5.5g. Activator of biting FISH XXL 50 ml spray. Fish attractant. 10 X Coarse Fishing Tackle Unloaded Waggler Floats Match Lake Thin Thick Tips. Hook size 12 drennan carp x strong. 5 X Chimp Foam Body Pole Rigs 0.4g Strong. 6 hand tied and handmade pole rigs made with top quality materials. Set up for bigger fish. I aim to provide a quality hard wearing item at an affordable price. New listing5 X Slim Chianti Foam Body Pole Floats 0.5g Strong Flexi Nitinol Wire Stem. 5 x slim Chianti foam Body Pole Floats 0.3g. I aim to provide a quality hard wearing item at an affordable price. hollow 2mm tip (standard sets are red but other colours are available - black green yellow pink). Hand made sea fishing rigs: 10 x mixed 2/0 rigs good for cod bass flatties etc top rigs. 2/0 hook rigs as shown in the picture plus one 15 pouch rig wallet. 10x 2/0 mixed sea fishing rigs good for cod, bass, flatties, etc with a 15 pouch rig wallet. Super soft non-toxic shots (Ballabeni): 2X Nr 8; 3X Nr 9. Hook length: 5" 0.14mm Tubertini EVO Silver. Tubertini Series 808 barbless hook size 16. All hand tied with quality components from start to finish. 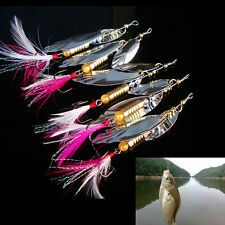 It covers all types of modern mini and micro lure fishing- both in salt and freshwater. Ideal for all predatory species, the applications are endless. 5 mf bd ratty. 0.3g 2.5m high viz tip the best foam is used for the bodies. the far bank i have fish 16m with these the tip stand out fantastic sit real well. 3 luminious eel lures. A super effective rig for shoaling bass, pollack and coalfish. for sea boat or shore fishing. MUSTAD 3-HOOK RED HOKKAI RIGS. A super effective rig for shoaling bass, pollack and coalfish. 3 x size 4/0 forged duratin hooks. Red feather & lurex tail. Reflector vanes.